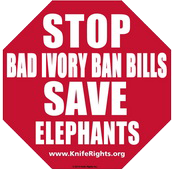 KnifeRights.org Press Release: Washington State Ivory Ban Fails. The proposed WA ivory ban bill failed to meet legislative deadlines. I love elephants. One of my fondest memories is when, as a student at the Koobi Fora Field School in Kenya, we followed our Massai guide through the bush until we reached a herd of elephants he had been tracking. To be on foot in the presence of the largest land mammal was really a breathtaking sight. I want to see them saved. “If you want to save a species, simply decide to eat it. Then it will be managed – like chickens, like deer, like Canada Geese. It is not such a bizarre idea. In fact the uber-left UK Guardian published a piece supporting this idea. In a nutshell, I don’t believe that prohibition ever works. I think that there is a better way. However, legislators in Washington State see things a differently. They attempted to pass a law which would do nothing to save elephants, but would needlessly harass law-abiding collectors of antique knives and guns. However, the Washington bill would have gone farther still, banning the trade in fossil mammoth ivory which is not only an extremely common material in modern knives, but would do nothing to protect extant, living elephants. Not all legislators are clueless. Bipartisan legislation has been proposed at the Federal level which would both take proactive steps to protect living elephants, as well as protect the legal trade in ivory antiques. Call or write your congresscritters and urge them to support the African Elephant Conservation and Legal Ivory Possession Act of 2015. You can find your representative at the House Directory. See the full KnifeRights Press Release on the Washington State ban’s failure below the jump. March 2, 2015 – Gilbert, AZ: Another irrational state Ivory Ban effort has failed, this time in Washington State. Once a bright light was shone on the lies and deceit of the Ivory- banners, the bills (HB 1131 and SB 5241) proved unable to move forward by legislative deadlines. Legal Ivory Rights Coalition, as well as our knife industry members, Mike Vellekamp (FOX Knives USA) and Tim Wegner (Blade-Tech) who testified against the bills at our request, we were collectively able to beat back the proposed draconian ban on ivory, including mammoth ivory, in Washington. Washington now joins Virginia this year in rejecting the emotionally charged, but factually deficient arguments put forth by promoters of these Ivory Ban bills. To all of you who made calls, wrote emails and came to testify, we are truly grateful for your help in defeating this misguided and irrational legislation. Knife Rights (www.KnifeRights.org) is rewriting knife law in America™, aggressively forging a Sharper Future™ for all knife owners. Knife Rights is dedicated to providing knife owners an effective voice to influence public policy. In the past four years, Knife Rights has passed pro-knife legislation in 11 states and prevented anti-knife legislation in six states. Knife Rights is also the lead plaintiff in a federal civil rights lawsuit against New York City.